HENEBERY SECRET MENU ITEM WITH ROMAN STONE OF SALT & CLEAVER IN SAN DIEGO - Henebery Spirits, INC. 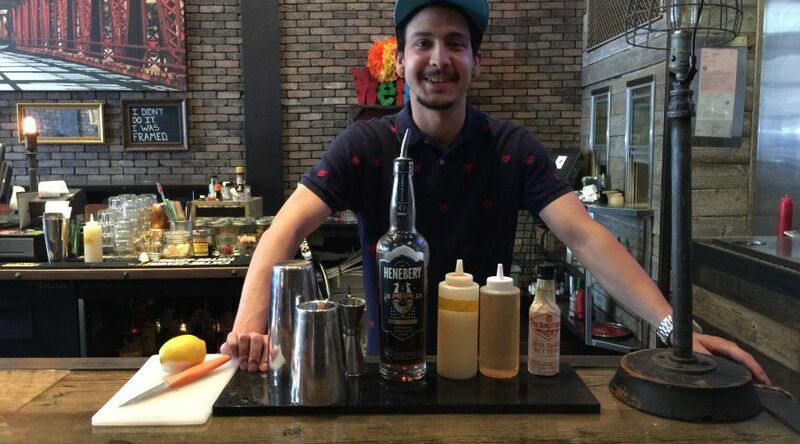 In this issue of Henebery Whiskey‘s Secret Menu series, Roman Stone of Salt & Clever made us a great cocktail named drink name the Rhubarbarian. Combine all ingredients, shake and strain over ice into double rocks glass. WHAT IS IT ABOUT THE RHUBARBARIAN THAT YOU LOVE? Roman: The Alibi with my friends. Or I like to class it up with the lady at Juniper & Ivy. Roman: Eating and drinking. I love trying the new restaurants that pop up. Current favorite spots to eat include: Cantina Mayhuel and Hinotez. Roman: Corralejo Reposado and Hendricks Gin. Roman: Right now is the Strawberry Blonde from Acoustic Ales. Roman: Crown Royal, and Hypnotic. It wasn’t the most pleasant experience. I started by playing quarters with shots of Crown as an early teen. Roman: From a newcomers perspective: listen, absorb, ask questions, retain information, be humble, stay modest and have fun!! We’re working in a bar. Roman: Day passes to the pool and day drinking at Lafayette Hotel. I’m either poolside or couchside playing Xbox Destiny. WHAT WOULD YOU RECOMMEND FOR THE FIRST TIMER AT SALT & CLEVER? Roman: Of course, I highly suggest the Rhubarbarian. For food: Duck Duck Pig (duck and bacon sausage and order of fried pickles). Go order The Rhubarbian at Salt & Cleaver. Thank you, Roman, for being a #spiritedcitizen.